I have the Best Team Members in the World! Exactly three weeks ago today I along with my wife, three children and my mother hopped on a plane and headed to China. Our goal was to add a little guy to our family. 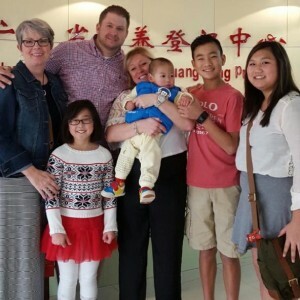 As you can see from the above photo we were successful and Tatum Albert Verlinde (AKA Xu Yan Zhoa) joined our family. It was a trip of a lifetime and after over a year of paperwork and planning, we were on our way. Three weeks I was not in office. Three weeks I never logged into my work computer. Three weeks I never had to reply to an “Urgent” email. Guess what happened in those three weeks? Houses were bought and insured properly. People added and deleted vehicles. People got into accidents and their claims were processed. The office even had a terrific month of writing NEW clients. All these things happened because of the wonderful team we have here at Verlinde Insurance Agency. The team doesn’t just punch a clock. They enjoy the contact that they have with our clients and the enjoy making sure that our clients are being protected from financial hardships. When I arrived back to the office there were not fires to put out and I realized that my thoughts were correct. The team could handle it and they did a great job at it! Super big thanks to Barb, Brian, Kathe and Mark. You guys are rock stars and I am so happy that you are a part of the Verlinde Insurance Team. Believe it or not, a new school year is just around the corner, and that means the start of flu season and lots of other viruses being spread around. And since many viruses can’t be treated with antibiotics, prevention is your best line of defense. If you want to avoid using your health insurance more than absolutely necessary, consider some of these tips for staying healthy this year. Washing hands. It may seem like common sense, but chances are, your kids aren’t doing it frequently enough. Wash after using the restroom, before and after eating, blowing your nose, playing outside, etc. Always have hand sanitizer available. When it’s not convenient to get to a sink, use hand sanitizer instead. Hand sanitizer is extremely effective and you can slip a travel-sized bottle in your children’s backpacks so that they have it available whenever they need it. Cover up. When coughing or sneezing, make sure you and your kids are covering your mouths and noses. And after you cover up, wash up! Don’t share. This goes against what we typically teach our children, but swapping everything from treats in lunches to markers and pencils means germs are being passed much more freely than they should be. Avoid others who are sick and stay home when you’re sick. There’s nothing more frustrating than sending your healthy child to school when other parents send their sick kids, but advise your kids to keep their distance from other sick children and keep them home when they’re ill. While some illnesses may be inevitable once school starts back up, there are things you can do to keep them to a minimum. What are some other ways to keep the germs at bay? Share your suggestions in the comments below! And for more information on Verlinde Insurance, contact us today. Summer ain’t over yet—and this sun is strong, folks. We have to enjoy the great outdoors while we can. After all, we spend a good 8 months shut inside thanks to our robust Midwest winters. But the heat can be just as dangerous as the snow and ice if we’re not careful. Wear sunblock (at least 30 SPF) and reapply regularly whether or not you feel like you’re burning. Drink copious amounts of water. Taking a dip in a refreshing lake can fool you into thinking you’re less overheated than you actually are. Staying hydrated will help. Eat lighter meals more frequently. Wear lighter, loose-fitting fabrics to stay cool. Try to avoid the outdoors during the hottest, sunniest parts of the day, or at least take shelter in a shady area. Are you a sun worshipper, or does the heat send you scrambling for your air-conditioned home? Share your love (or hate) of the summer in the comments below. And contact us for more information on Verlinde Insurance. Ah, these glorious summer months are ripe for grilling, and no one loves a good barbecue more than me. Having said that, safety is definitely something you can’t take lightly when it comes to grilling. As your friendly neighborhood insurance guru, I can’t stress enough the difference a few small precautions can make between tragedy and a fun evening with family and friends. Keep the kiddos and your four-legged friends away from the grill when it’s on. Don’t leave the grill unmanned. If you’re keeping an eye on the grill, you can catch a fire before it gets out of hand, and you can also catch any elusive children or furry ones from getting too close. Leave an acceptable amount of space between your grill and anything else—deck rails, house siding, etc. Always grill outdoors (the only grill that should EVER be used indoors is a little George Foreman grill—and grilling safely indoors is a whole different ball of wax). Once your grill is cooled completely, clean it thoroughly (make sure it’s clear of grease) and cover it with a weatherproof grill cover. That’s a wrap! Have any fun grilling stories to share? I’d love to hear them in the comments below. And contact us to make sure you’re up-to-date on your homeowners’ insurance—if you don’t follow my patented grilling tips, you’re going to need it! I love me some bicycling. I wouldn’t say I’m an avid cyclist, but it’s something that my whole family enjoys doing. And let’s face it, the window of weather conducive to outdoor cycling in Michigan is limited, so we have to make the most of it when we have the chance, right? However, riding one’s bicycle isn’t for the faint of heart. Sure, a 4-year-old can do it, but there’s a certain amount of risk involved when you take the streets on two wheels with only a few pieces of plastic protecting you from the pavement and four-thousand-pound vehicles. Practice “defensive biking”—keep both hands ready to brake at a moment’s notice. Wear protective gear. Yes, that helmet may mess up a great hair day, but it’s much better than the alternative if you get into an accident. Use hand signals wherever necessary to indicate whether you are turning or continuing on through an intersection. Look ahead for any road hazards that might be coming up. This is where those hands on the brakes will really come in handy. Don’t pass on the right side of a vehicle—drivers may not be able to see you coming from the right side. Obey traffic laws and signals, just as if you were driving an automobile. This includes biking on the right side of the road. Make sure you can be seen. This means ensuring you have a taillight or reflector on your bike at night and are dressed in brightly colored clothing, so you’re easy for motorists to spot in the dark. Got any other burning suggestions for biking safety? I’d love to hear them! Share your thoughts in the comments below. Back in November 2013, I was attending “Brand Camp”, an industry marketing event—I’m always trying to stay at the top of my game when it comes to being the best agency in the region. What I didn’t expect was that I’d make so many great friends at this event. I was having dinner with several up-and-coming agents in the industry, including digital marketing guru Liz Kittell. When it came time to order, the Brussels sprouts sounded really good, and Liz and I ended up sharing an order of them. Somehow, those Brussels sprouts have become a running joke between Liz and me. I’ve started a Brussels sprouts garden in my own backyard, and I routinely taunt her when I’m enjoying a serving of them. This goofy friendship, however, has transformed into a great working relationship. Liz and I enjoy bouncing ideas off one another and she’s been a great help to my agency’s marketing. So what’s my point? The Brussels sprouts story, to me, illustrates the way we can so easily get caught up in the day-to-day struggle with work, activities, and obligations that it becomes hard to be present and engage with people other than immediate family and a few close friends. If we’re not paying attention, we can miss opportunities to connect with other human beings and develop new relationships. So I’ve been inspired lately to make more of an effort to connect with my clients and friends. I want to be a regular part of your lives as well as your friendly neighborhood insurance expert. It means a lot to me to be one of the top agencies in the Richmond area and I don’t take the honor lightly. It’s my goal to always be open and available to clients and others in the community. To that end, I’ll be updating this blog regularly, sharing my experiences, what’s going on with our agency family, and some (hopefully) helpful info for my clients. Feel free to shoot questions and comments my way, either in the comments section below or through our contact page.